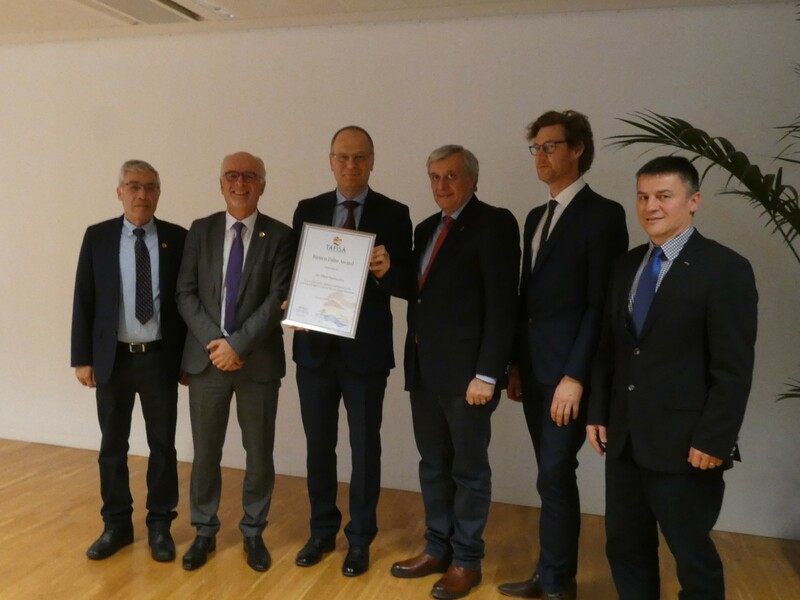 The Jürgen Palm Award, TAFISA’s most prestigious award, was presented to European Commissioner for Education, Culture, Youth and Sport Tibor Navracsics for his exceptional contribution to the growth of the international Sport for All Movement. 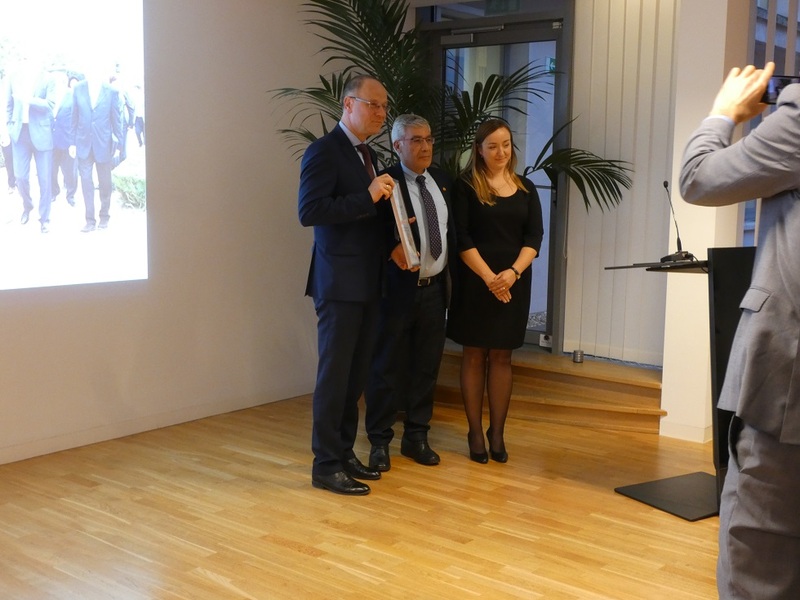 The TAFISA Jürgen Palm Award Ceremony took place on Tuesday 5th February 2019 at the Representation of the State of North Rhine-Westphalia to the European Union, in the presence of prestigious guests, including TAFISA Treasurer Herzel Hagay, TAFISA Vice-President Europe Peter Barendse, TAFISA Secretary General Wolfgang Baumann, TAFISA Board Members Janez Sodrznik and Dionysios Karakasis, Committee of Regions Director and Sport and Citizenship President Laurent Thieule, EuropeActive President Sir Graham Watson, European Cyclists' Federation Secretary General Bernhard Ensink, ISCA Secretary General Jacob Schouenborg, ENGSO President Carlos Cardoso, ICCE Secretary General Ladislav Petrovic, Ikkaido CEO Ray Sweeney, TAFISA Europe Steering Committee Members Malgorzata Szukalska-Wrona, Patrik Perosa, Dusan Mitic and Yasin Bolukbasi, and representatives from the European Commission, Knowledge Center Sport Netherlands, Portuguese Institute of Sport and Youth, Latvian Sports Federations Council, ENGSO Youth, ICSSPE and UNESCO, among others. The Ceremony started with a welcome from TAFISA Vice President Peter Barendse who commended Commissioner Navracscics "for his outstanding contribution to the growth of the international Sport for All Movement". TAFISA Europe Co-Chair Malgorzata Szukalska-Wrona followed with praise for the Commissioner's commitment to Sport for All, highlighting "Dr. Navracsics promotes Sport for All and physical activity as a powerful tool in social policies, including education, integration, youth and health. Dr. Navracsics understands and promotes the value of volunteers and volunteerism which is at the very core of TAFISA and the entire Sport for All movement. He is, undoubtedly, a man of grassroots sport" and citing some of his many accomplishments, namely the initiation of the High-Level Report on Grassroots Sport, the launch and successful growth of the European Week of Sport, the increase of budget for the Erasmus+ Sport Chapter and the Tartu Call for a healthy lifestyle among many others. progress we have made in promoting sport & physical activity in our communities & encouraging more people from all backgrounds to be active." The Jürgen Palm Award is handed every two years to selected individuals who have made a significant and long-term contribution to the field of international Sport for All and physical activity. Former awardees include, among others: late ICSSPE President Prof. Margaret Talbot, IOC Member Mr. Sam Ramsamy, UN Secretary General Mr. Ban Ki-Moon, former ENGSO President Bengt Sevelius. TAFISA would like to once again congratulate and thank Commissioner Navracsics for his unwavering commitment and support to the Global Sport for All Movement. TAFISA also thanks the Representation of the State of North Rhine-Westphalia to the European Union for hosting this prestigious event, and the many high-level guests who joined this celebration of Sport for All.